Jennifer Lawrence is striking in latest Dior campaign | HELLO! September 17, 2014 - 12:18 BST hellomagazine.com Jennifer Lawrence wows as she stars in Dior's autumn/winter 2014 campaign. Jennifer Lawrence is the ultimate empowered woman as she stars in Dior's autumn/winter 2014 campaign. Sporting slicked back hair and pastel-coloured smokey eyes, the 24-year-old actress looks striking as she poses in a series of black suits with plunging necklines designed by the Dior's creative director Raf Simons. 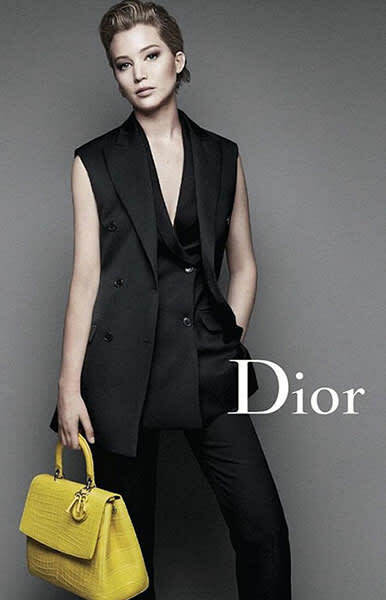 The campaign images, shot by legendary photographer Patrick Demarchelier, also see Jennifer modelling a variety of the brand's Be Dior bags in pastel colours, including pink, blue and yellow. "A powerful woman is someone who exudes confidence and can be tough but fair and kind," said Jennifer in an accompanying behind-the-scenes video. "And also knows how to get what she wants." This is the fourth campaign for Dior in which the Hunger Games actress has starred, with Jennifer sharing a close relationship with the iconic fashion house. As well as being spotted on the front row at their haute couture show, Jennifer repeatedly wears the designer's creations on the red carpet, most notably choosing Dior Haute Couture for the 2013 Oscars where she won the award for Best Actress for her role in Silver Linings Playbook. Jennifer, who has won over the fashion industry with her laidback and chic approach to fashion, was also recently announced as the host of the 2015 Met Ball. The Metropolitan Museum of Art also revealed the theme for the exhibition – Chinese Whispers: Tales of the East in Art, Film and Fashion. The Hollywood star will be following in the steps of Sarah Jessica Parker and former co-star Bradley Cooper, both of whom co-hosted the 2014 gala. Outside of the world of fashion, Jennifer was spotted enjoying dinner with Coldplay singer Chris Martin in Beverly Hills, prompting speculation that the pair have become an item. "They were super cute together," an onlooker told People. "They were laughing a lot and Jennifer was acting all goofy!"